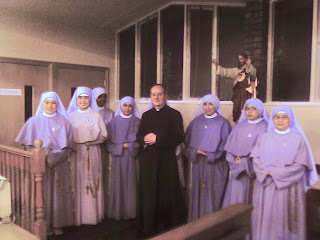 The intrepid Catholic Mom of 10 has run out of house-room... to be more precise, she can't put up any more photos on her blog as she's reached her Blogger limit. Undaunted, Jackie has set up a new blog. The old one is not being deleted, it just won't be updated, so she's asked us all to amend our blogrolls accordingly. You can find the new blog OVER HERE. 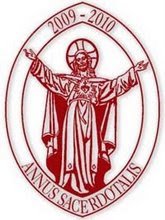 We have a very beautiful High Mass set of red vestments. 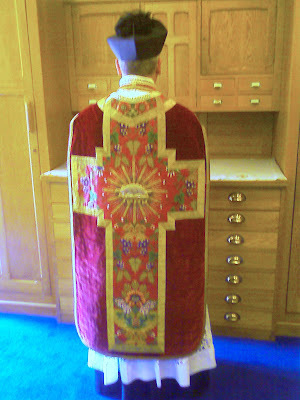 Hopefully, we're being treated to a High Mass tomorrow for Pentecost, but I thought I might not manage to get a clear close-up of the chasuble, which is stunning... so I scooted into the Sacristy and snapped this one. Enjoy! I spotted this one over at Mark's blog, and it made me chortle... not quite sure what Leutgeb will make of it! Sylvester's eye looked a little odd a while back... However, I couldn't see anything obviously wrong, and he didn't seem listless, or in pain. I concluded that he'd probably had a run-in with one of the neighbourhood cats and come off a little the worse for wear. ...and then yesterday I saw a big, black "shadow" appear over his eye. From one angle it just looked like his pupil, and then it moved over the iris. I decided that this was one for the vet. I managed to get the last free appointment slot for this evening. I needed to go to Bluewater first, to sort out a mix-up with my contact lenses, but figured that I could just about get back home in time to scoop up the cat, stuff him in the kitty-carrier, and dash straight back out again. This required military precision and planning. I was counting on him being greedy enough to greet me when I arrived home. He was. 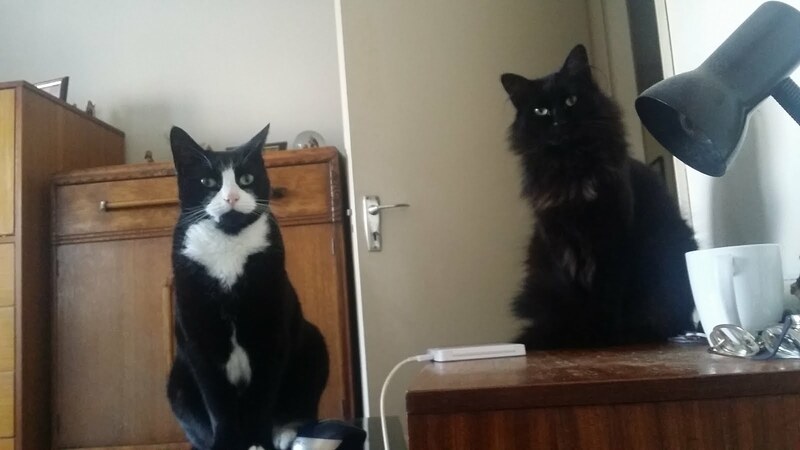 My first move, after greeting him was to lock the cat flap. He may be fat and indolent, but he can still move pretty smartly when he wants. Next was the super-sneaky retrieval of the kitty-carrier. I opened it, lined it with a towel, and positioned it carefully. Only then could I approach the cat, scoop him up - ostensibly for pre-feeding cuddles - and then try to get him into the carrier. Why is it that a normally four-legged feline suddenly seems to sprout legs when one approaches a kitty-carrier? 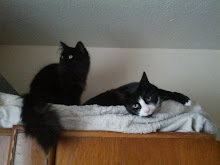 And I swear that Sylvester's tail became prehensile! I did manage it, eventually. 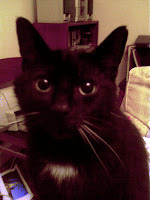 However, the car journey to the vet's surgery was a real ordeal (for me) as Sylvester mewed pitifully the whole way. The senior vet knew exactly what was wrong: a corneal sequestrum. The exact cause is unclear, but it can result from some injury or irritation to the eye which results in a patch of the cornea dying. The dead tissue can slough away, and may leave an ulcer. However, the vet thought that, as the condition sometimes sorted itself out, it was worth trying a fortnight of treatment with an antibiotic cream for Sylvester's eye... though if there was no improvement, he would probably need surgery, maybe to remove the eye completely. Is Anyone In A Betting Mood? I have a hectic week ahead. I found that the only delivery slot for my groceries which was practical (and would arrive before I found I needed to actually venture out to the shops for myself) was the 9pm-10pm slot this evening. Anyone care to bet against the delivery van arriving at the end of the slot? 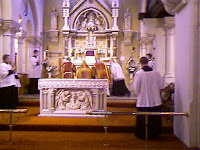 Monday, I went to Corpus Christi, Maiden Lane, for their Rogation Day Mass. This was followed by a most agreeable session in the Coal Hole, a local hostelry. I have it on the best authority (several Camra members) that the beer there is very good. I wouldn't know, as I'm nearly always driving, so I was on the Coca Cola. Tuesday was the quietest day this week... but I needed to do some housework (mainly laundry) and cook lunch for the week ahead. I'm not a brilliant cook, but I have a few favourite dishes which I can rustle up when necessary. I was in the mood for a lamb-and-macaroni-cheese bake thingy which is a variation (ie. it's my attempt to remember it) of a Greek Cypriot recipe which a friend told me about many years ago. My main problem is that she didn't know what the herbs were - it was a special Greek mix - and so I have to guess. The end result, as far as I'm concerned, is edible, which is all that matters. A job-lot of that sorts out lunch for the week, except Friday. Wednesday was pretty hectic. First a Year Team meeting after school. Then a session of spiritual direction. Then on to a session of Child Protection training at the parish. Information about procedures and form-filling. I was amused by the fact that I had to fill out an application form for the post of catechist, and toyed with the idea of not applying... but I suspect that I wouldn't be allowed to back out of Confirmation classes quite so easily! Thursday was the Feast of the Ascension. Totally not obligatory. But it would have taken a whole troupe of wild horses to prevent me from going. Especially since it was a Missa Cantata. And this was then followed by a session in the Parish club. I believe that the beer isn't quite as good as that at the Coal Hole, but I was on Coca Cola again, so it made no difference. 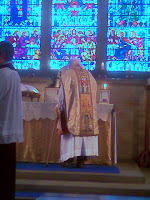 Friday there was a Mass at St. Etheldreda's, Ely Place. I'm not quite sure why I allowed myself to be talked into going to that one rather than attending Mass in Chislehurst, but it seemed like a good idea at the time... and I'd never attended a Mass there before. This was followed by a brief sojourn in the Mitre Pub. There's a historical connection between the pub and the church, something to do with the Bishop of Ely's palace, but it escapes me for the moment. I am assured that the beer is very good... but I was almost Coca Cola'd to death by this time. Saturday proved to be a day for recouping lost energy. The usual Saturday morning Low Mass was followed by some time for prayer and reflection (though Exposition & Benediction had been cancelled) before the First Communion Mass. 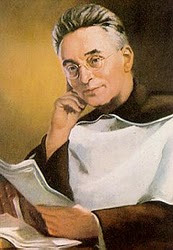 I stayed for that because of the "promise" that a Plenary Indulgence was attached to First Communion Masses... and I need as many Holy Souls as possible waiting to meet me when my time comes! 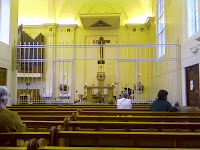 After Mass on Sunday morning, I drove down to Marble Arch and parked the car outside Tyburn Convent. I then made my way back to the Old Bailey for the Tyburn Pilgrimage. The rain held off, and the weather was almost perfect for walking. However, mindful of the fact that I have one dodgy left knee and one dodgy right ankle, I cheated, and cabbed it from church to church. After Benediction at the Convent, and a brief visit to the Crypt Chapel to venerate the relics of the martyrs, I drove home with a friend who had done the walk properly. ...but as my neighbour's garage was open on the Bank Holiday, I drove down and demonstrated what I meant by "noises." The upshot was that I wasn't imagining things, but that the exhaust was just moving around a bit too much, so something was bolted into place. 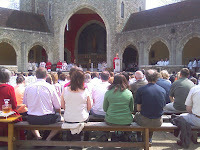 Luckily this didn't take long at all, and I was able to drive down to Aylesford for the Mass at the Altar Servers' Rally. I went back home almost immediately after Mass (coursework marking season!) but it was a lovely day for a drive... and I was also able to check that the noises had truly disappeared. The coming week is going to be almost as hectic, but it'll be closer to home, so less tiring... at least, that's the theory! I have been pretty annoyed with the results of some of the photos I've taken with my phone camera. The colour seems to go completely mad, with everything far more yellow than it should be. I tried using my computer's photo-editing software, and couldn't quite get it right... so most photos have just gone up unedited. However, I decided to give Adobe Photoshop a try... I saw that there was a cheap one going on Amazon, and snapped it up. And then forgot about it. The CD arrived during the week, but I've been a bit busy. which is rather an improvement. Watch this space for further experiments!